Plain and Simple, this is brilliant. Support this project on KICKSTARTER! The Galileo is a revolutionary, iOS-controlled robotic iPhone platform with infinite spherical rotation capability. Just swipe your finger on the screen of your iPad or other iOS device and Galileo reacts, orienting your iPhone or iPod Touch accordingly. With applications in areas of photography, cinematography, social networking, and video conferencing, Galileo gives iOS devices endless possibilities of remote-controlled motion. Capable of infinite 360° pan-and-tilt at speeds up to 200° per second in any orientation, Galileo is an invaluable tool to everyone from an amateur photographer to the professional cinematographer, and vastly improves the experience of video chat for anyone needing to stay connected. Funny Name, I assure you it stops there. 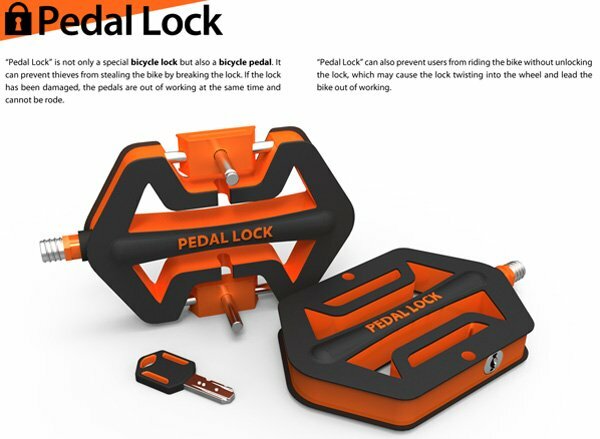 As we all start to bike commute more, this will be great, based on this application we have a bicycle lock that deters theft in a very clever way. The pedals double up as wheel clamps and are designed such that breaking the lock (or pedal) will not only be a tough job but also a foolish endeavor. Superb!